With Thanksgiving fast approaching, I thought it would be appropriate to share a piece from the memoir cookbook I’ve been working on for awhile now. It’s a piece about my Pop, who was our holiday cook for many, many years. 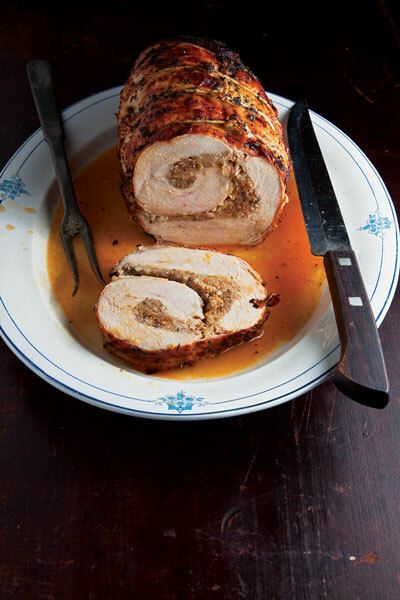 I’ve preceded it with a few related writing prompts, and a link for a Turkey Breast Roulade that will save you three hours in the kitchen (and set you free from the enslavement of that big bird). Here’s that link, plus a few writing prompts. What I wrote follows. I never used to think about how he did it: cooked for all of us, every holiday. Easter ham, or leg of lamb, and one year, a delicious duck. Christmas Eve he made lasagna, in the two white Corning Ware casseroles with the tiny blue flowers on the side. Christmas dinner was sometimes filet mignon, my brother, Jerry, helping with the grill. Sometimes it was risotto with pancetta, asparagus, and lemon zest. “Keep stirring,” he’d tell me, handing me his wooden spoon like it was a scepter. I’d stare into the orange Le Crueset and watch the sauce thicken, the Arborio rice swell. He made three-course meals for ten, twelve, fourteen—once sixteen people—fresh bread and butter on the table, three wine glasses at every place-setting, tapers down the length of our old dining room table (with both leaves in place), an eight-foot collapsible conference table butted up against it, both tables covered with cream-colored clothes. The small living room of his rented house transformed into an elegant dining room, the family and guests taking their seats expectantly. Dessert was often cheesecake; he made the most wonderful flavors: dark chocolate, mocha, pumpkin, ginger, and one year, tropical cheesecake, made with coconut milk and topped with kiwi, pineapple and banana. He was fearless, trying new recipes for a party of twelve, substituting balsamic or brown sugar or sour cream. And he did all of this with a seeming effortlessness, that I now know (since I cook and bake and have dinner parties myself) was part pure joy and part illusion, and he did it while enjoying a glass of wine and some quiet conversation. He became a cook by default, and not until he was sixty-two, when my mother became ill. At first, he made the old stand-bys: burgers, broiled hot dogs with melted cheese, Sloppy Joes, pasta. But then he began reading Gourmet and Bon Appétit, and tried his hand at braising, marinating, searing. Eventually, he bought subscriptions to both magazines, bought copper-clad pans, and made his own simple hanging rack for the collection of sauté pans he was acquiring. He invested in a food processor (which I inherited 20 years later; it starting smoking one day, and I had to invest in one of my own). He made his own pesto sauce, béchamel, tapenade, romesco. And he mastered the most difficult meal of all: Thanksgiving. His timing was impeccable; everything came to the table hot: stuffing with andouille sausage, mashed potatoes with sage gravy, dinner rolls, green beans with slivered almonds. The stove-top candied yams were evenly sliced, drizzled with maple syrup, sprinkled with cinnamon, and dabbed with pats of butter, waiting patiently in the skillet as early as 1:00. He carved a golden brown turkey in an effortless way, and years later he taught me how he made it look so easy. We even got him to laugh the year it rolled out of the roasting pan and onto the kitchen floor. He lost his cool at first, something he rarely did while cooking, swearing, burning his hand slightly as he tried to wrestle the bird onto the platter. We patted it off, praying no dog hair would surprise us later as we bit into the butter basted breast. “Pop,” I asked, “what did Julia Child say when she dropped the veal on the floor of her studio kitchen?” (It was a story my brother Marty told us sometimes when we prompted him; he did a great imitation of her.) He laughed then, breaking open, and I said, “Oh, well. There’s no use wasting good veal.” And just like she did that day, we picked up our meal off the kitchen floor and served it. Delicious, as always. This week’s post is a recipe only, although the title could be quite an interesting prompt. Budin Azteca, or “Aztec Casserole,” leaves much room for your own additions, including chicken, which I found in many of the recipes I researched on-line. The one below is vegetarian, and quite the savory meal. 1. Heat oil in skillet, add the onion and garlic and saute until transparent. Add the tomatoes and salt and cook over high heat for 5 minutes. Lower the heat and cook for 10 more minutes. Correct the seasoning and set aside. 3. Melt the butter in a saucepan. Add the corn and zucchini and cook 2 minutes. Add the water, cover and cook over low heat for 8 minutes or until the zucchini is tender, but not mushy. It should still be slightly crisp, otherwise it will be too mushy when you bake it in the casserole. 5. 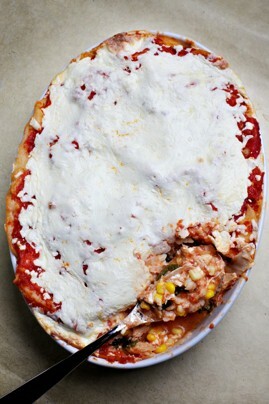 Place a thin layer of corn and zucchini mixture on the bottom of a greased 9×13 inch baking dish. Top with a layer of corn tortillas and then a layer of tomato sauce. Add half the remaining corn and zucchini mixture, half the chiles, 1/2 cup cream, and 1/2 cup cheese. Repeat the layers, finishing with the cheese. Bake uncovered until the cheese begins to melt. About 10-15 minutes.